The Palestinians are seeking to press war crimes charges against Israel at the International Criminal Court in The Hague. The court’s prosecutor has opened a preliminary investigation, but not made a decision on whether to move ahead with a case. Jerusalem: The Israeli military said on Wednesday its investigation into one of the bloodiest incidents of the 2014 war in the Gaza Strip found no criminal wrongdoing by Israeli forces and there were no grounds to prosecute any troops. The announcement drew condemnations from Palestinians and human rights advocates, who accused the military of a whitewash. The investigation focused on an Aug. 1, 2014, battle in the southern Gaza town of Rafah that erupted after an Israeli military officer was feared abducted by Palestinian militants during a cease-fire. Over 110 Palestinians were killed in the daylong fighting, and Palestinian witnesses had complained of heavy and indiscriminate shelling by Israeli forces. Following what it called a comprehensive investigation, the army said its military advocate general determined “a criminal investigation is not warranted into the incidents that occurred during the fighting.” Fearing a soldier had fallen into enemy hands, Israel invoked its “Hannibal” procedure — a protocol that allowed the heavy use of force to prevent the capture of a comrade. Israeli forces attacked the area with artillery fire, tanks shells and airstrikes. At the time, Palestinian residents described a terrifying ordeal as they fled their homes and searched for cover amid heavy shelling of their neighbourhood, located on the outskirts of the city. Human rights groups identified 121 people killed and accused Israel of committing war crimes by allegedly using disproportionate or indiscriminate force and failing to distinguish between civilians and combatants. The Israeli investigation identified over 110 dead — including 42 militants and up to 72 civilians who were “unintentionally killed.” In one instance, it said 16 civilians were killed in an airstrike on a family home that was targeted due to faulty intelligence. But it said all of its actions had “clear and legitimate military purposes” and found no evidence that attacks were indiscriminate, aimed at civilians or motivated by revenge. The “Hannibal” directive was cancelled by the military in 2016 following heavy criticism. Last year, the military introduced a revised version. Human rights groups have accused the Israeli military of ignoring or covering up wrongdoing in its investigations over the years. B’Tselem, a leading Israeli human rights group, condemned the latest findings. “The military advocate general proves again that no matter how high the number of Palestinians killed is, nor how arbitrary the circumstances of their killing by the military was, the Israeli whitewash mechanism he heads will find a way to bury the facts,” it said. The 2014 war was the third and most devastating round of fighting between Israel and Gaza’s Hamas rulers. 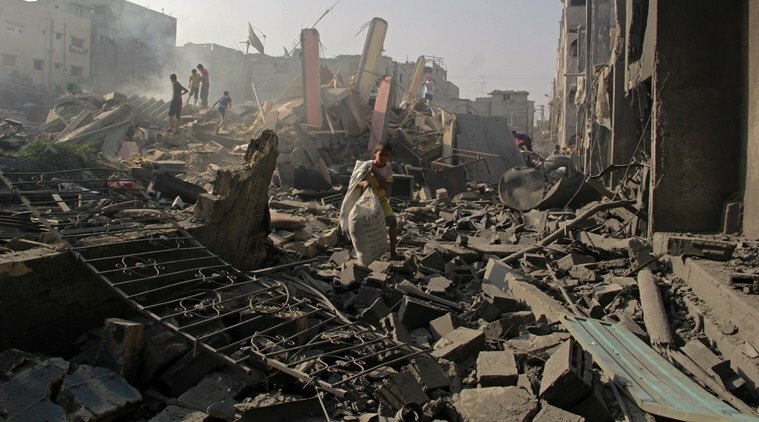 Over 2,200 Palestinians were killed, including hundreds of civilians, and widespread damage was inflicted on Gaza’s infrastructure. During the 50-day war, 73 people were killed on the Israeli side and continued rocket fire on Israeli cities disrupted life throughout large parts of the country. A key factor in that decision could be whether the prosecutor believes Israel’s own investigations into actions by its troops are credible.